They’re back…the annual invasion of the lubber grasshoppers. Small lubber grasshoppers appear to bubble up from the soil forming a black mass that move in groups as they consume plants along the way. Don’t procrastinate! Now is the time to target the control of these pesky critters while they are young and gregarious. 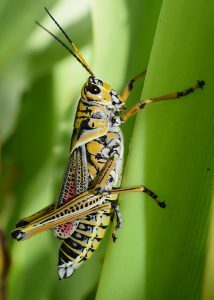 Although they will occasionally feed on young fruit, grasshoppers are predominately leaf feeders. And boy can they eat. Young lubbers can strip plants of leaves and eat them down to the ground. Extensive damage has been recorded on citrus, vegetable crops and landscape plants. Favorite foods at our office are daylilies, daffodils, plumbago, and amaryllis. Once you have them in your landscape, they are almost impossible to eradicate. Young lubbers emerge from the ground in mid to late March. They are called nymphs and initially stay in groups which makes them easier to spot. Although they vary in color, they are typically black with one or more yellow, orange, or red stripes on the front legs and sides of the head are red. Nymphs molt five times, growing in size and going through subtle changes before reaching adulthood. Adult lubber grasshoppers are intimidating because of their large size. Males and females reach 2.5 to 3 inches long, respectively. There are several color variations but the most common is dull yellow with black spots and markings. Although they have 2 pairs of wings, they can’t fly. Jumping is not one of their attributes either. They are rather sluggish at this stage making them easy to catch. In mid-summer, females seek higher ground and begin laying eggs in slightly moist soils. Each female grasshopper deposits between 3 to 5 egg masses and each mass has about 30 to 80 eggs. Eggs overwinter in the soil and lie in wait for suitable soil temperatures in the spring. Don’t expect help from predators. 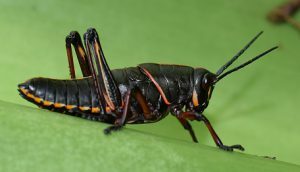 If ingested, lubbers can be poisonous to small mammals and birds. Control is a challenge so don’t delay. Here are a few options. Early nymph stages can be effectively controlled by spraying them directly with pesticides like carbaryl, bifenthrin, or permethrin. Nosema locustae is a biological control product (NOLO and Semaspore) that includes a protozoan (infects grasshopper) and a bait. It has a short shelf life, is only effective on early stage nymphs, and is very slow acting. Use a bucket of rubbing alcohol and place it underneath the infested plant. Tap the plant, knocking the grasshoppers into the bucket. Wear gloves to handpick grasshoppers from plants and place into a bucket of alcohol. Clip adult grasshoppers in half with scissors or hand pruners. Have a stomping party! Stomping the grasshoppers on a hard surface is a very effective control method. Keep weeds to a minimum because they really thrive in open fields and weedy areas. 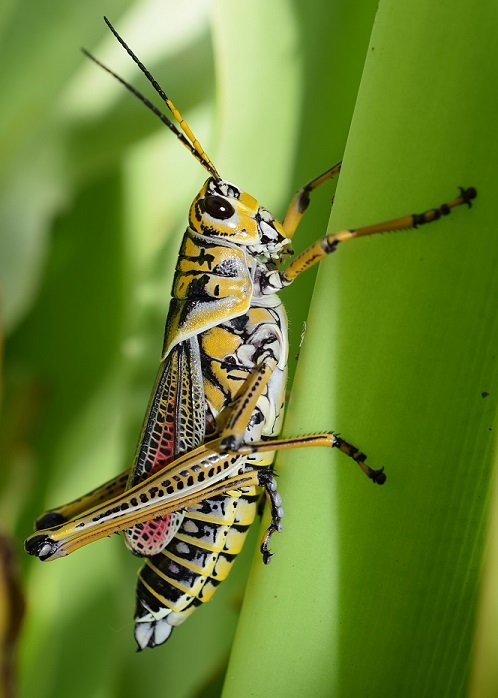 For more information on lubber grasshoppers, click here.